Read Part I on disassembly and Part II on the hull and suspension. So far we’ve seen how the hull was restored between 1990 and 1994. 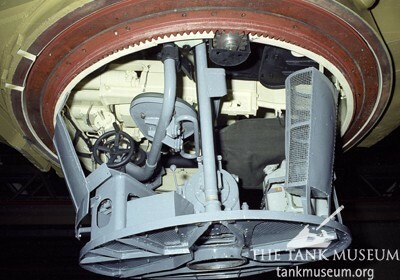 As you can see above, during this time the turret was displayed on a stand in the Museum. 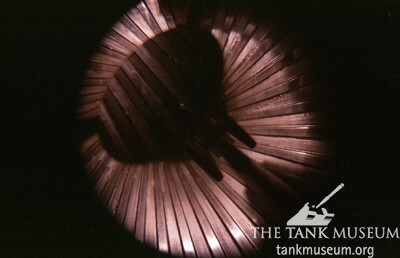 Now, while the turret was easy to view, we did a photographic survey of the interior. Preliminary investigations suggested it was in remarkably good condition. Beyond some minor damage and mild surface rust it was virtually complete and everything seemed to work. 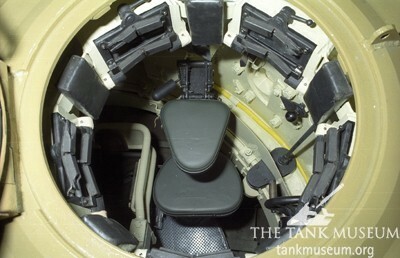 This is the back of the turret, with the commander’s seat in the folded down position. By 1998 it was clear that a full restoration of the Tiger was beyond the Museum’s resources so a bid for money from the Heritage Lottery Fund was launched. We received £96,000, and matched this amount ourselves. The Army Base Repair Organization (ABRO) at Bovington was contracted to carry out the work and they began with the turret in May 1999. Here Dave Marsh supervises as the 88mm gun is removed from the turret. Notice the counterweight hanging from the barrel to keep it balanced. 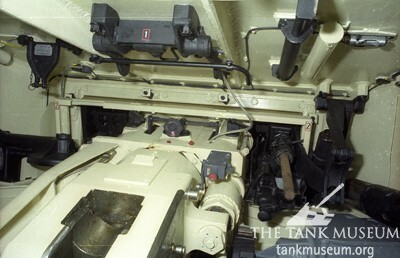 With the gun removed we get an unusual view of the trunnions and the interior of the mantlet. The rust, which looks quite bad here, was quite superficial and easily removed. The gun itself, the dreaded eighty-eight, was now dismantled and cleaned. ABRO staff were so thorough that they even photographed inside the barrel and took cast impressions of the rifling. These revealed that the gun had already suffered considerable internal damage caused by the burning effect of firing. This is what it looks like inside the eighty-eight. The most unusual view of a Tiger you will ever see! Here various fittings from the turret are laid out for inspection, prior to restoration and repair. 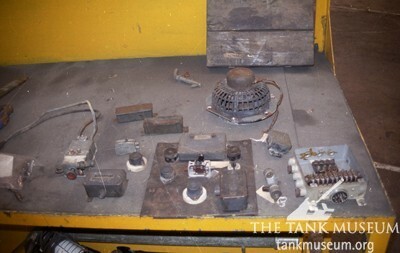 These include junction boxes, light fittings and the big turret extractor fan. 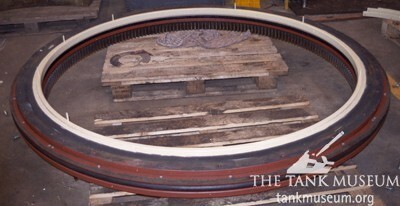 The turret ring assembly, seen here after cleaning and priming. One of the most astounding discoveries was that the inflatable rubber tube, used to seal the turret ring during wading operations, was still in good condition. The valve was damaged but once this was repaired the tube could still be inflated, over fifty years after it was installed! 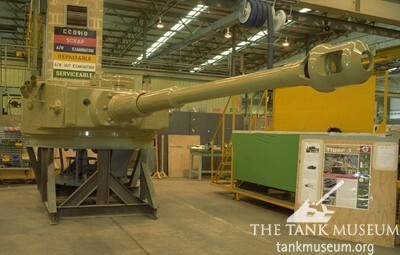 The turret shell was cleaned and re-sprayed before the fittings were reinstalled. By October 1999 the work was complete. 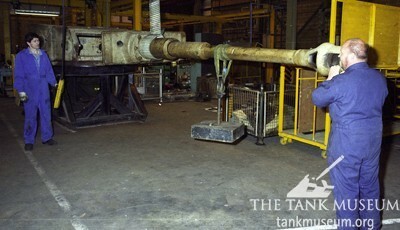 Here it is, inside the ABRO workshop, ready to be shipped back to The Tank Museum. If you compare this photograph with the same view from 1991, the quality of the work is obvious. The extractor fan, which we saw earlier, is now in full working order. This is the view down into the commander’s cupola. The mechanisms on the glass vision blocks work, authentic wiring is in place and the seats have been recovered in the correct material. 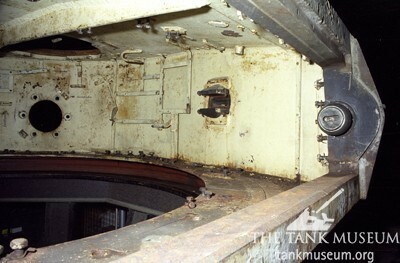 Looking forwards, over the top of the breech we see the inside of the mantlet. The wood is filling the co-axial machine gun aperture. Here’s a view you won’t see every day! While the turret is hoisted by crane the photographer got some shots from underneath. Here we are looking into the left hand side of the turret. We can see the gunner’s seat on the left and the commander’s behind and above it. 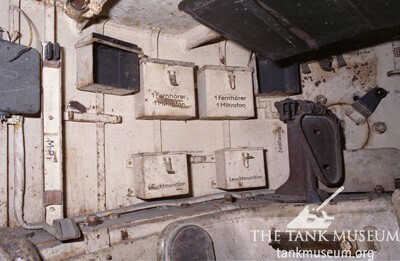 The underside of Tiger 131’s turret. And why was it up in the air? In October 1999, ABRO carried out a trial fit of the turret onto the incomplete hull. A sight nobody had seen for five years; hull and turret reunited, at least for a while. A great deal of work remained to be done, but at this stage we really felt that there had been some progress. In the next post, we return to the hull. The photo of the opened turret shell is interesting because it shows dark grey paint at the inner front side. 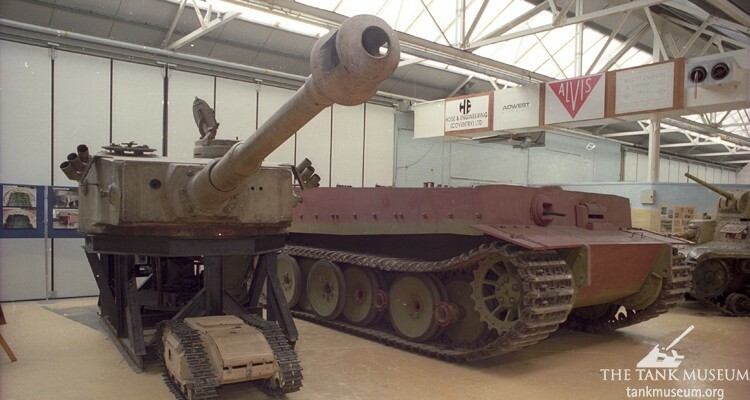 This is not the only evidence proving that Tiger 131 was painted Dunkelgrau when first assembled. 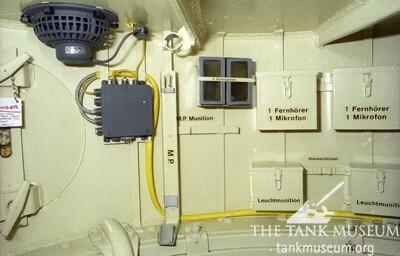 This Tiger’s tropical base coat RAL8000 must have come later, when the mantlet was already installed. Dark grey paint was dropped in favour of Dunkelelb soon afterwards.